Luxury Ski-In/Ski-Out Townhome Right At the Base! 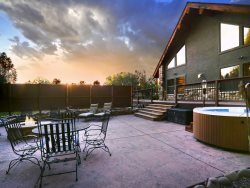 Hot Tub, Incredible Views, Custom Ski Room! If you are looking for location, location, location then stop your search for the perfect ski property! It doesn't get any better than Silver Ridge 1. Located on the slopes and right at the base area, this is your families next spot for skiing or summer hiking since both activities are literally right off your deck! This townhome is an end unit so it is filled with light and looks out directly to the slopes and the peak of Mt. Crested Butte. Pull into the tandem 2 car heated garage and enter the home through the front hallway or put everything in the elevator which will take that heavy luggage all the way up to the master suite! The first level of this home has a large deck outside looking all the way down to the Whetstones and inside you will find a large guest bedroom with two double beds and en-suite bath with dual vanities. Up one flight is the main living level and the heart of the home. The newly remodeled kitchen is a chef's dream and everybody can relax in the great room around the gas fireplace, catch the big game on the TV, or just take in the views through the two stories worth of windows! Off the kitchen is the custom ski room with cubbies, benches, access to the slopes, and a 10 pair boot dryer! No more wet and cold boots in the morning! Step right off the deck and snap into your skis for true ski-in/ski-out, or lace up the hiking boots in the summer and take off for endless trails. Being right on the mountain makes lunch convenient for the whole crew to meet up and swap stories from the day. Down the hall is a powder bath, another guest bedroom with queen bed and en-suite bath, and of course, the Hot Tub! Located on it's own deck off the living area with incredible views it's a great place to relax after a hard day of activities. Upstairs you will find the loft area overlooking the living room and taking in views of the peak from the picture windows. It's a great place to check e-mail, relax with a book, or just get away. The master bedroom is also on this level with a King 4 poster bed and awesome views! The en-suite master bath has a shower, dual vanities, and a soaking tub. Whatever the season, your family will find Silver Ridge 1 is a great place to call home during your vacation!